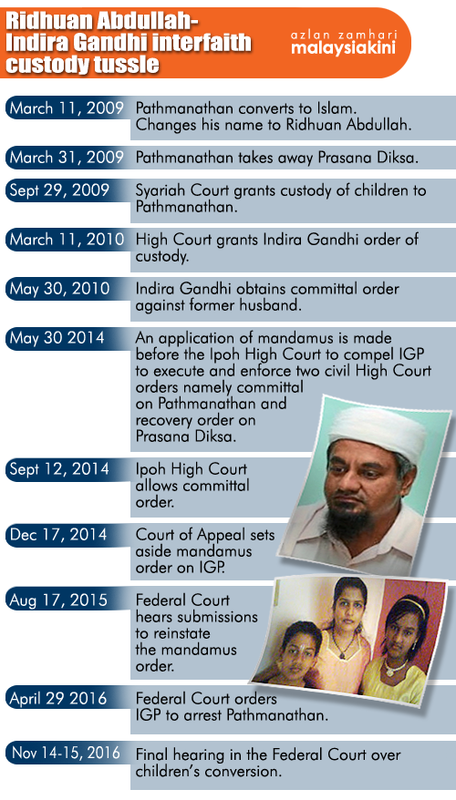 The Federal Court today ruled that the definition of "parent" should be plural, in its verdict in the unilateral conversion case involving the children of M Indira Gandhi and her ex-husband Ridhuan Abdullah. This is a departure from the 2007 verdict in the case of R Subashini vs T Saravanan, which saw the Hindu wife instructed to seek recourse through the Syariah Appeals Court with regards to her Muslim convert husband converting their children to Islam without her consent. Court of Appeal president Justice Zulkefli Ahmad Makinudin, who led the bench, said the decision was unanimous, and stressed that although unilateral conversion is a contentious issue, today's decision was not swayed by religious convictions. Federal Court judge Justice Zainun Ali, who read the 99-page unanimous decision, ruled that the civil court has jurisdiction to review the actions of the Registrar of Muallafs, which is one of the respondents, if there is illegality. 3) Whether the mother and father (if both are still surviving) of a child of a civil marriage must consent before a certificate of conversion to Islam can be issued in respect of the child. The court answered all three questions in the affirmative, and ruled that the Registrar of Muallafs has no right to register a child if he or she does not recite the Islamic affirmation of faith, the kalimah syahadah. Thus, the court ruled that the permission of both parents is needed in changing the faith of the child, and in doing so, set aside the decision of the Court of Appeal.